Chinese motorcycle brand Regal Raptor are now introducing three of their seven bikes in India through their Hyderabad-based partners, JRS Industries. The sub-brand taking care of the motorcycle operations for JRS is called Fabulous and Beyond (FaB) and is being managed by 21-year old MG Shariq. He likes motorcycles but isn't particularly a biker, because 'bikes can be dangerous', his elders tell him. Well, motorcycles aren't inherently dangerous but they can be unforgiving in the event of stupidity or unfortunate miscalculation. But for people who think otherwise, there are bikes like the DD350E-9B which are rather lenient. It is the bike that you see here. It probably hasn't received as much love as the other cruisers in the Regal Raptor portfolio as it doesn't get a unique name like the Daytona, Bobber or Spyder. Let's just stick to the 9B then. At first glance, the 9B's low-rider stance will remind you of the Yamaha Enticer, more so in the red colour. The raked tank, tall handlebars and the rooster tail contribute to the resemblance. The 9B also has smaller proportions than its stablemates. At a wheelbase of 1570mm, it's got a 110mm shorter footprint than the Bobber and compared to the Daytona, it has plenty of chrome. 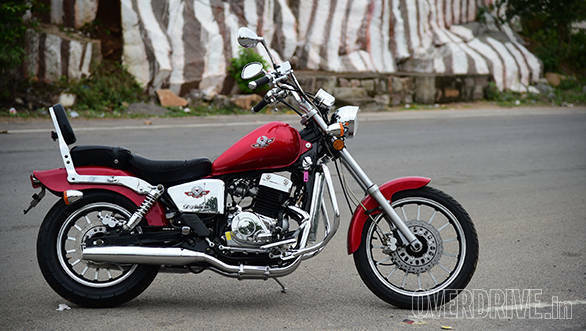 The clutch and stator cases, the radiator guard, the exhaust mufflers, the handlebars, the instrumentation, the mirrors, the battery and air box cover and even the chain guard - they're all chromed out. On a sunny day, it could shine so much that it would be the motorcycle equivalent of the Silver Surfer (sans the speed). 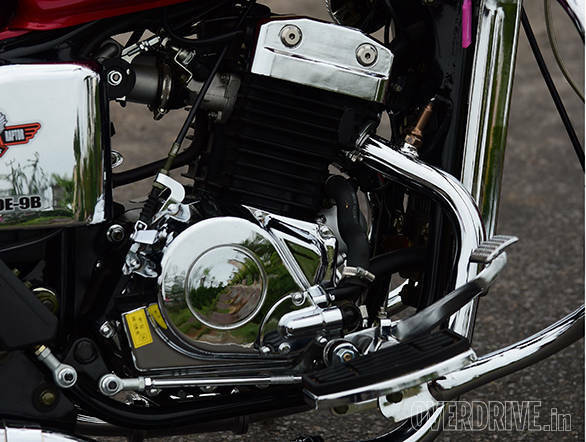 The chrome isn't tastefully done either and on our test bike, it was already peeling off the switchgear. The 9B has a twin-exhaust system too and the pipes are made fatter to add some bulk (visually) to the otherwise small cruiser. The machined wheels have a cart wheel design and get a black and chrome design which actually looks quite good. But the bling aside, the 9B looks like the ideal commuter cruiser in the range. 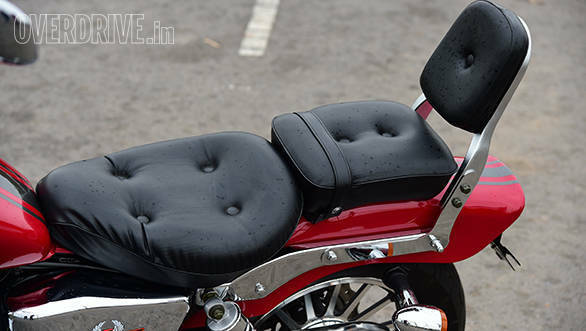 It gets a chunky guard for the engine and the rider's legs, has generous sized seats and has rider footboards instead of pegs. 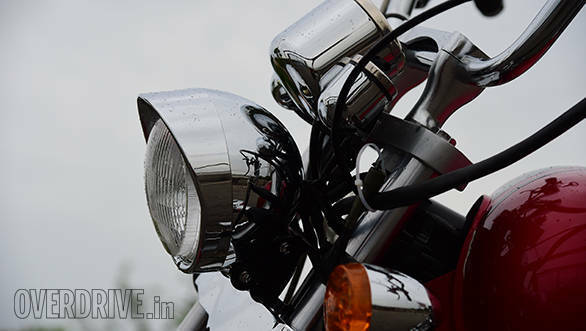 It also uses a conventional box-type swing arm with dual shock absorbers at the rear and telescopic forks at the front. The forks are not raked too sharp either, so manoeuvring the bike is very easy. The 9B is 10kg heavier than Bobber but feels lighter, thanks to the more ergonomic riding posture. I have known quite a few female riders who thought the world came crashing down after Yamaha discontinued the Enticer. Most of them could feel at home with the 9B. The setup also feels quite comfortable over long distances and on our day out with the three Regal Raptors, the 9B was the comfiest of all. The 9B gets the same 350cc parallel twin engine as the rest of the Regal Raptor lineup and it is a smooth operator. Its 23PS/22Nm output is more than adequate for the cruising chores of the 9B. 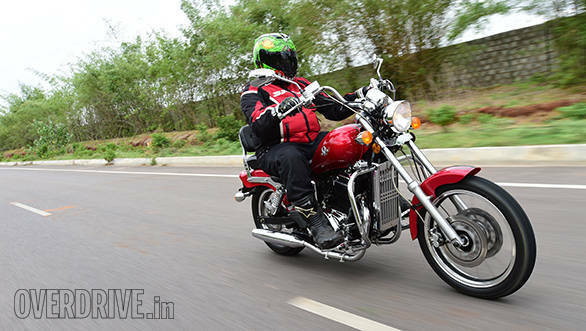 Be it pottering around town or cruising on the highway, the engine feels quite relaxed up to 110kmph. It can reach its claimed top speed of 130kmph if you have enough road, but the mill starts feeling rough at anything in the red zone on the speedometer. Otherwise, the engine sounds smooth and goes with the commuter-ish attitude of the motorcycle. In fact, it makes the Bajaj Avenger sound harsh. The 5-speed gearbox is spongy and upshifts were inconsistent. Regal Raptor claim a fuel economy of around 30kmpl for all their bikes (no ARAI certification yet). On our short stride, we couldn't test the real world fuel economy, but going by the relaxed nature of the engine and the relatively low speeds it is set to do, those claims don't sound unrealistic. The bike also comes with a dual disc setup up front and a single disc at the back. 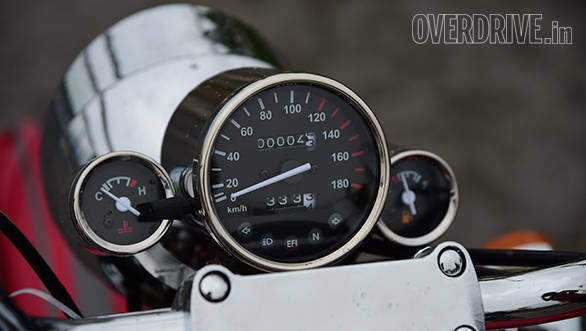 For the kind of speeds it attains, you wouldn't need so much braking power, but there is nothing to complain about. Unless the brake pads are wearing off too fast and cost a bomb to replace. And speaking of costs, Regal Raptor sound a tad optimistic with their India plans. 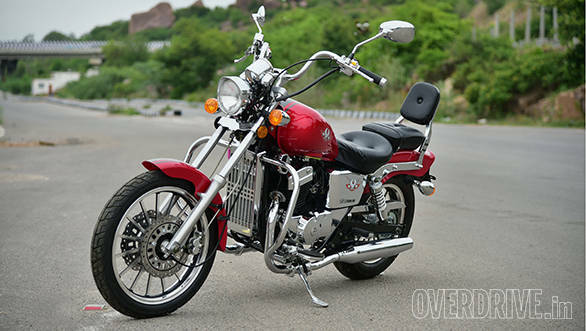 The ex-showroom price tag of Rs 2.96 lakh (pan-India) for the DD350E-9B is indeed a lot of money. It wears a brand name that is little known to us and that raises questions on its long term reliability, cost of ownership and ease of service. For the kind of design, quality and equipment it wears, a price tag of under Rs 2 lakh would have been more realistic. It isn't as easy on the pocket as it is to ride, then. But you can give it a chance.